By the end of the 1970s, the U.S. had come to see the regime of Muammar Qaddafi as systematically pursuing policies antithetical to those favored by Washington, i.e., as an enemy. When Reagan arrived in office in 1981, a new CIA assessment of Qaddafi declared him overextended in Chad , where several thousand of his troops were present. The U.S. response was to launch a covert operation to aid rebel forces in Chad (who were already being assisted by France and Egypt ) with arms, training, and funding; this later was accompanied, as we saw in earlier chapters, by encouragement of and logistical support to France in its Chadian military operations. In addition, Reagan approved the first of several efforts at goading Qaddafi into attacking U.S. military forces, in order to have an excuse for direct, overt strikes against him (see chapter six of the book for a discussion of those strikes). 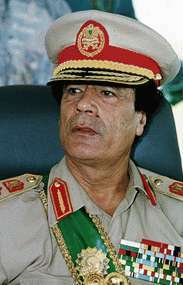 However, neither of these policies offered any significant near-term hope of overthrowing Qaddafi in Libya .